Join us for our Annual Membership BBQ on Thursday, September 13 at Community Business Bank! 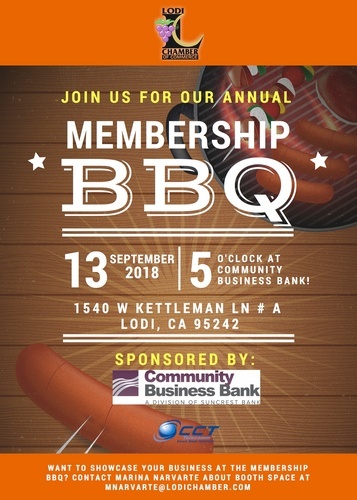 This BBQ is to celebrate all of our members- and if you are interested in having a booth space to promote your business, contact Marina Narvarte at mnarvarte@lodichamber.com. Each Chamber Member will receive 2 complimentary tickets to this event- but additional tickets can be purchased for $5 each by clicking the link above. We look forward to spending the evening BBQing with all of our wonderful members.